As we enter the new year, many builders across Michigan are working to create safe, cost-effective outcomes for a variety of clients. One smart method of delivering ideal designs in our harsh environment is to invest in structural steel applications. 2019 will continue to see a shortage in skilled trade positions, creating a higher demand for high-quality labor. In order to offset the costs and demands, many builders will be turning to structural steel as an ideal solution that delivers rigid strength and precision while avoiding many of the costs associated with materials and manpower. If you’re considering this modern building material, Sanilac Steel is here and ready to help! Since 1967, our structural steel fabricators have helped Michigan builders create an ideal outcome in the safest, most cost-effective way possible. From structural steel design to erection, our team has the training and equipment to complete the job correctly and on time. Today, we’ll highlight a few of the top reasons why you should consider structural steel for your building plans. If you’re ready to receive your free estimate for our services, then be sure to contact us today! Why Rely On Structural Steel? Steel is a reliable source for structural support, and the level of precision delivered by this modern building material helps to simplify the design process. Your steel fabrication company will be able to craft beams and plates that fit precise tolerances, relying on proven processes to deliver consistently strong materials that are sure to perform precisely once delivered to the jobsite. Sanilac Steel is here to streamline our design and fabrication processes to allow you to focus on the many other elements including in raising your structure. Sanilac Steel specializes in structural steel fabrication off-site, creating precise elements to be used in your structure while other preparations and services are being completed. This level of precision and detail further simplifies the complex demands of the design process. It pays to rely on a company that delivers the right pieces for your structural framework, especially considering how slight errors can result in costly delays. If your structural steel is delivered on-time and perfectly meets your design specifications, then the steel erection process will be fast and efficient. 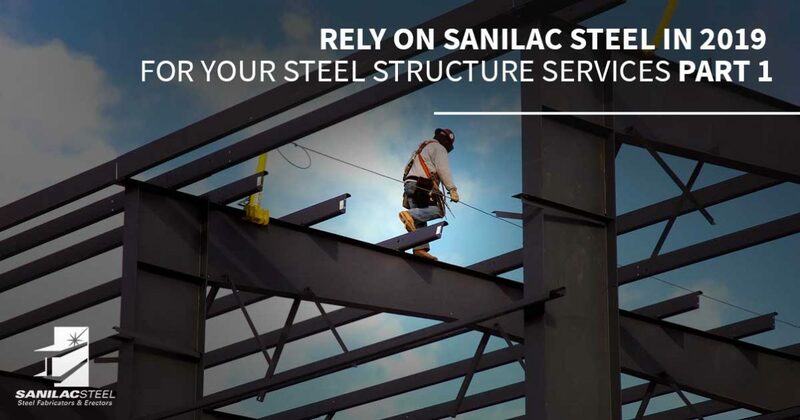 Sanilac Steel is here and ready to deliver comprehensive assistance through every step of your project. Call us today to learn how! The increased strength and relative lightweight nature of structural steel makes it ideal for use in large buildings. Instead of relying on columns and additional piers for support, large-span buildings can instead deploy specialty designs that account for a variety of load demands while resisting destructive forces. The value of your structural steel will be apparent throughout the erection process. Today’s steel fabrication companies have streamlined the process to minimize waste and subsequent costs, reducing the price tag both up front and throughout your project. The lighter weight and stronger support of steel also allows architects to reduce the demand for other materials and labor, including foundations, façades, and more. Building designs evolve and change over time, leading many property owners to update their existing building plan to allow for expansions. Structural steel is ideal for this venture, as its rigid frame can be modified without a worrisome loss of load support or force resistance. Updated building codes can also be hard to plan for, which is another reason why steel has become a top choice for buildings across the globe. If you’re expecting future modifications or additions to your structure, a steel structure design will prove to be worth the investment. There are many reasons why structural steel has become a top choice for framing and structural support across the country, and we’ll continue to discuss this topic in part two of this series. If you’re ready to get to work, then be sure to contact us today to speak with our structural steel fabricators and to learn about our comprehensive services!